Welcome from Saint Patrick Catholic School Athletics and thank you for your interest in our community and athletics program. We believe that athletic participation serves as an important part of a child's education and can provide an exceptional paradigm for life. For this reason, we encourage all students to participate in athletic activities when and where possible. Additionally, we offer athletic opportunities that allow the greatest participation from the student body. 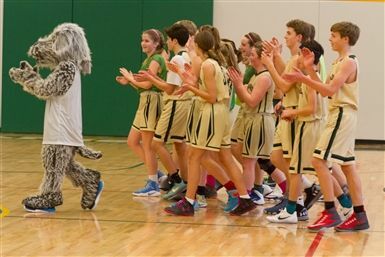 Students as young as second grade can participate on a Wolfhound sports team and middle school students can pick from seven teams that compete against some of the largest schools in the area. In just twelve years, our student-athletes have captured 44 conference championships. Despite the many successes, it is critical that team-building, physical discipline, and sportsmanship remain priorities in preparing our students for high school and beyond. Thank you for supporting the Wolfhound athletics program and the student-athletes we serve. We look forward to seeing you at our athletics competitions this year. Go Wolfhounds!